ICYMI: We’re now offering this list via email. Sign up here. Nectarines make an appearance, but peaches take a break (we’ll have some ugly peaches, though). I have a pepper problem. It’s not that I’m eating them in crazy quantities — or at least that’s not the problem — it’s that I want to try every single kind of pepper, and I want Radish & Rye to carry every single kind of pepper. But here’s a secret: peppers (other than bell peppers) are not huge sellers. This causes me agony every week as I review the lists from various farmers and find myself wanting to order five or ten different varieties of peppers, but knowing that we don’t have the table space or the customer interest for that to really be a good idea. I’m not one of these people who is obsessed with hot peppers. I don’t even like anything particularly spicy. But there is something about the endless variety of peppers — sweet and hot — and the idea that some peppers have a clear highest and best use (New Mexico green chiles should be roasted), while others are very versatile (Hungarian wax peppers are great pickled, chopped as a milder substitute for jalapeno, fried, and on and on), combined with the fact that they all offer different balances between sweet and hot and a surprisingly wide variety of flavors….and I just want to try them all. But I can’t, at least not in any given week. So, this week’s “novelty” pepper is: the habanada. 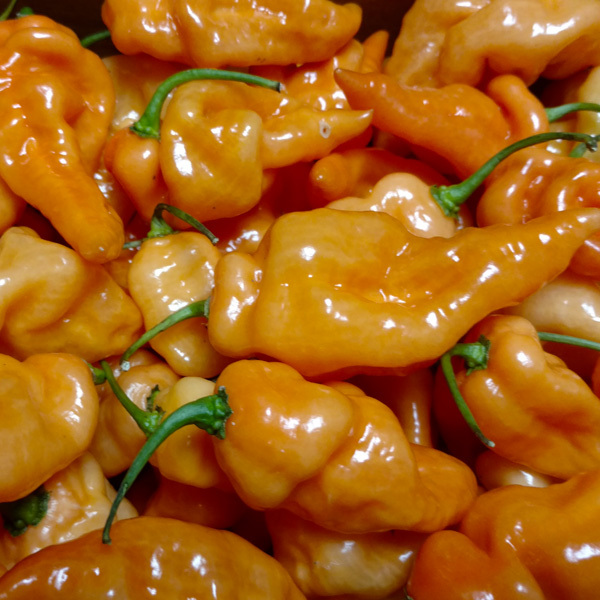 This is a habanero — you know, the super hot one with the really awesome flavor — that has been bred to retain its awesome flavor, but none (or almost none) of its heat. It’s incredible. You take a bite, you taste that flavor, you think, “Oh s–t! What have I done?!? !” But the burn never comes — you just get to keep enjoying that awesome flavor. We got a small sample from Deb at Village Acres last week, and fried them up in some olive oil, then tossed with salt. Dusty broiled some cheese-laden bread, and we made sort-of pizzas, or open-faced sandwiches, piling the fried habanadas onto the bread and topping them with heirloom tomatoes and basil. They were WHOA good. Just writing about it is making me think we need to make real pizza tonight, with another round of fried habanadas. And a big salad on the side. P.S. In the course of writing this, I got distracted and started googling recipes for Hungarian wax peppers. These two caught my eye: Hungarian Lesco, Cheese Stuffed.